Russian master Alexander Krylov, who took part in the reconstruction of the Amber Room in the Catherine Palace in St. Petersburg, realised a miniature model of the Amber Room in his workshop. He now dreams of creating an entire iconostasis out of amber. At first glance he could be mistaken for an orthodox priest. Alexander Krylov wears his hair bound up in the back and his face is covered by a bushy beard. He turns 60 in September and will then receive a monthly pension of 100 euros ($130). Living off that is impossible, so he will continue working. Alexander Krylov has achieved a lot in his life. His life’s work is nothing less than the Amber Room in the Catherine Palace in St. Petersburg, located in the suburb of Pushkin. He worked on it for 24 years. In the end, up to 50 people were part of the reconstruction, but he was part of it every step of the way. In the beginning, the supervising director was a stickler for details, making sure everyone came on time and stayed late. Krylov thinks he is still under the influence of that man, even though he has been an independent contractor for the past 10 years. In 2003, there was a ribbon cutting ceremony for the Amber Room, after which Krylov opened a workshop in the center of St. Petersburg and employed Dennis Fedotov as his assistant. To this day, Fedotov primarily produces ornate jewelry boxes as souvenirs for foreign tourists. He worked on two such boxes for five weeks, engraving sails in the sheets, sanding, coloring and polishing them. It quickly becomes clear that his customers are very wealthy people. And the price of amber is going up. “Increases in price of up to 30 percent over a 3-month period are completely normal,” Krylov complains. The amber comes almost exclusively from Kaliningrad. The special fondness that Russians, Poles and Germans have for amber is easily explained. Amber has always been precious and was used by the Tsars to make expensive gifts. After their downfall, the knowledge and craftsmanship of the amber masters disappeared. Therein lies the reason – no one was willing to pay anymore. Alexander Krylov believes that the same is happening now as well. The fascination for amber remains, but nowadays no one is interested in the artist behind the creations. All this may sound somewhat bitter, however Krylov does not seem like a man resigned to giving up. On the contrary, he seems to be at the peak of his artistic creation. Krylov’s creations have long since exceeded mundane jewelry boxes. In his workshop stands a miniature model of the Amber Room that impresses scores of visitors. Next to it on the right is a female torso and to the left a bust of Peter the Great. 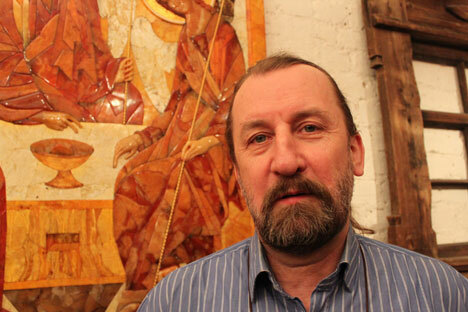 Right next to that are three monumental religious icons – everything is made of amber. He wants to prove that the fossilized resin lends itself perfectly to sculpture or to creating large-sized religious icons. His dream is to one day create an entire iconostasis out of amber. In orthodox churches mass is held in front of these iconostases. Behind them lies an area that is off limits to churchgoers. An entire iconostasis made out of amber would easily require 10 years of work and an enormous amount of money. His assistant calls the 59-year-old Krylov determined. According to him, Krylov always achieves what he sets his mind to. Many myths about the Amber Room still exist today. It was commissioned by the Prussian king, Frederick I, and was originally located in the Berlin City Palace. After that, it was given to Tsar Peter the Great and it was moved to the Catherine Palace in St. Petersburg. At the beginning of World War II, German forces dismantled the Amber Room and transported the pieces to Kaliningrad. Since 1945, it has been considered lost and myriads of theories exist as to its whereabouts. Its estimated value of 150 million euros ($195 million) keeps treasure hunters around the world intrigued and looking. In 1981, the decision for the faithful reconstruction of the Amber Room in the Catherine Palace was made. It was completed with German financial assistance in 2003, just in time for the 300th anniversary of St. Petersburg, in which amber artist Alexander Krylov played an essential part.